This is the view looking up from Triund, which at 3000m is 1000m above Macleod Ganj - that 1000m is a few-hours slog up a good path. Triund is a 'base-camp' for further exploration, with tents and rooms to rent, and inevitable chai-tents. We had booked a guide to take us up towards the Andrahar Pass at 4300m - but we were not going to attempt that. 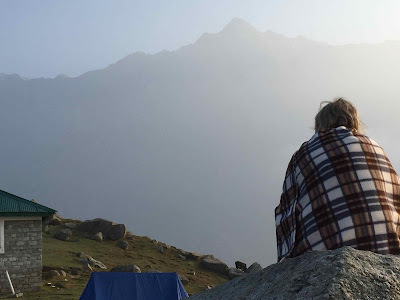 Here is the memsahib in the morning at the lodge we had booked through Summit Adventures - fairly rudimentary but a bed and a warm sleeping bag, which was needed. Had a snooze in the afternoon and woke to have pakora and chai in bed, which was a bit of a treat. The earth toilet in a small tent reminded us of trekking, similarly the joy of 'tent-tea' in the morning. But happy not to be sleeping in a tent. 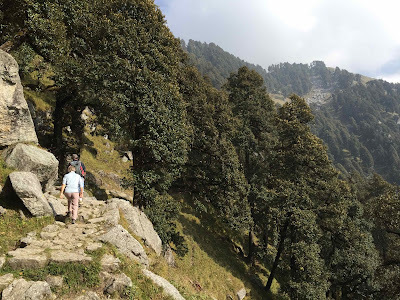 The path leads steeply up from Triund along a steep cliff through fine forest which eventually peter out into a slightly desolate landscape of large granite rocks interspersed with grass, rather like the Dolomites. 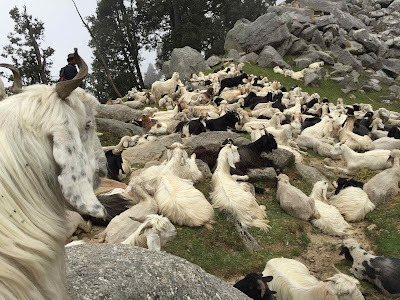 The mist started thickening, but then down towards us came a huge herd of goats which had been led over the pass that morning. They were, not surprisingly, exhausted as they had been on the move since 5am in incredibly inhospitable terrain. The shepherd was carrying the youngest goat, and we both had a cuddle. Then it just sat looking a bit pathetic with a 'carry-me' expression, until it got picked up again. 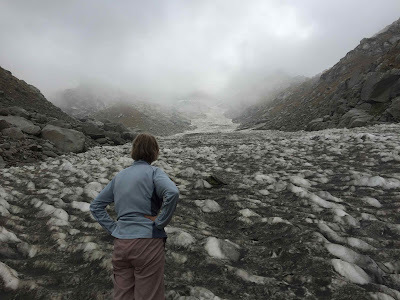 We got to the glacier, which was grubby and slippery. 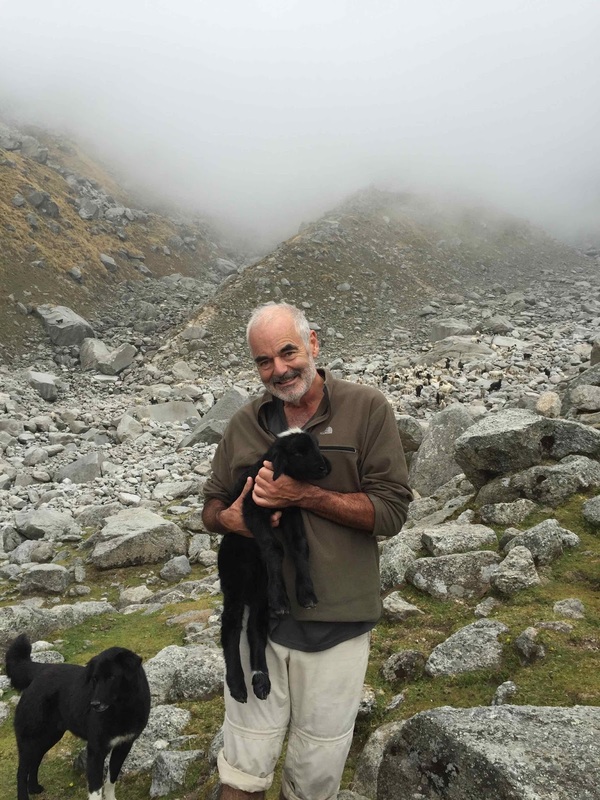 Then on up an almost vertical path to the Lahesh cave at 3500m, and that was quite far enough. 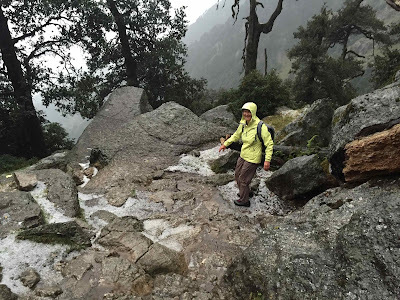 Very happy to turn back - the weather was grim and I did not envy the people we saw carrying on. Met the goats again on the way down, who had collapsed in heaps where the grass started, and were due to stay there and recover. We just stepped through them, like that scene at the end of The Birds. The next day we started down happily the path from Triund, when there was the most dramatic storm - huge lightning flashes, deafening thunder and hailstones like large ballbearings. Almost frightening. We plodded on, Kate helpfully pointing out that it all was transient, but we got very wet and cold, not being properly eqipped for storm and tempest. Briefly stopped at a chai-stall only to find a group sheltering who were on a charity trek for Alder Hey hospital. 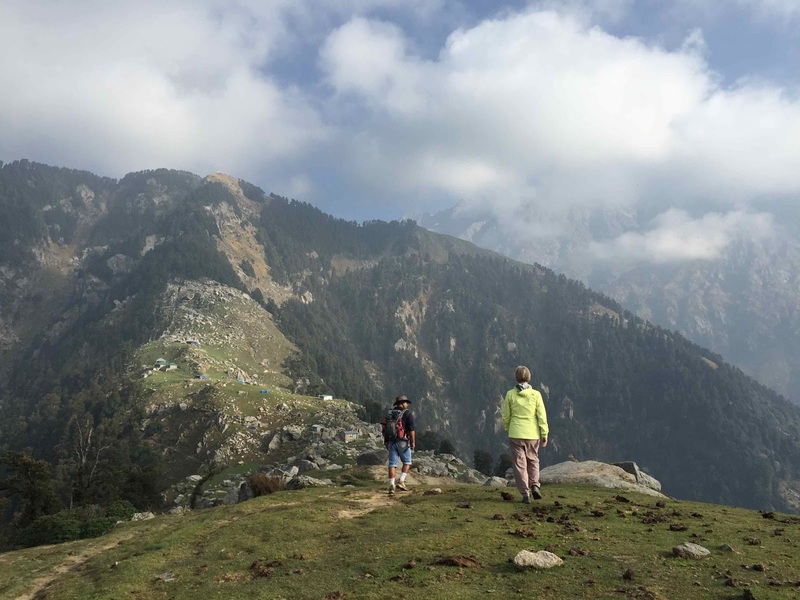 We were very relieved to be greeted by a blast of hot air as we walked down to Dharamkot, and looked forward to a latte and pancake, just like Ice Cold in Alex. But the first cafes we came to had no power, so no latte - this never happened to John Mills and his Carlsberg. But eventually found someone who could provide the goodies.